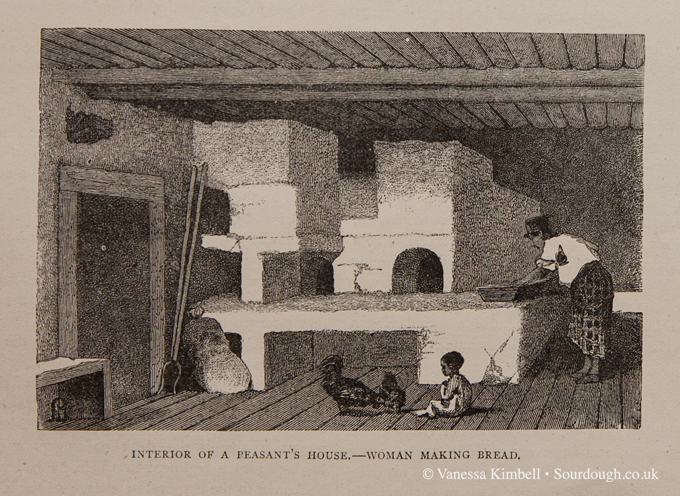 From Egypt, bread-making also spread north to ancient Greece, where it was a luxury product first produced in the home by women, but later in bakeries; the Greeks had over 70 different types of bread, including both savoury and sweetened loaves, using a number of varieties of grain. The Romans learned the art of bread from the Greeks, making improvements in kneading and baking. The centrality of bread to the Roman diet is shown by Jevenal’s despair that all the population wanted was bread and circuses (panem et circenses). We have sourdough recipes from seventeenth century France using a starter which is fed and risen three times before adding to the dough. The French were obviously far more interested in good tasting bread over an easy life for the baker. 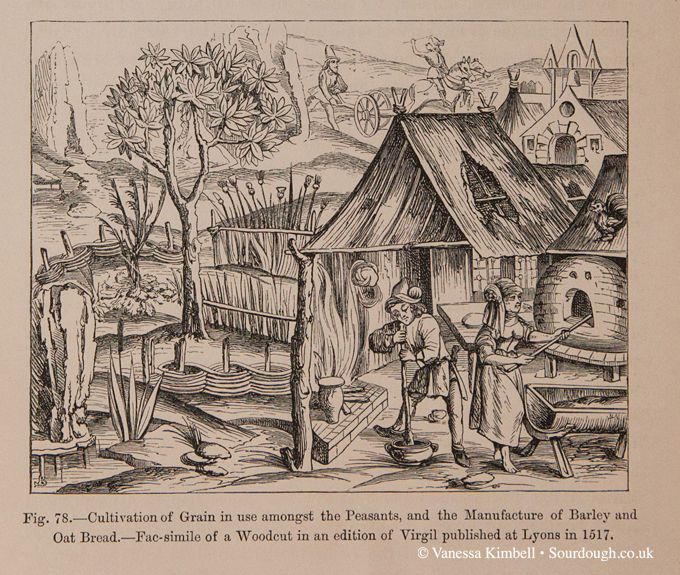 The introduction of commercial yeasts in the nineteenth century was to the detriment of sourdough breads, with speed and consistency of production winning. By 1910, Governmental bills preventing night work and restricting hours worked made more labour intensive production less sustainable, and in response, the bakers moved again towards faster raising breads, such as the baguette. It’s only since the nineteen eighties that there has been demand again for sourdoughs in the UK, to the extent that in 1993, regulations were issued defining what could be sold as a sourdough bread. In Germany, again, the use of sourdough was universal until brewers yeasts became common in the fourteen and fifteen hundreds. The overlap between brewing and baking was reflected in monasteries producing both bread and beer, using the heat of the oven to dry malted gain and the yeast to raise the bread. However, the big difference was that in Germany, sourdoughs continued to be used for rye breads, even as bakers’ yeasts became more popular for all other types. 1517 Lyon – bread was often made with a wide variety of grains including oats and barley as well as wheat and groups peas and beans. The prospectors and explorers in the United States in the nineteenth century were referred to as sourdoughs as it was a practice to keep the mother leavening on your person, to make sure it didn’t freeze in the bitter winters. Personally I think that it was to get the yeast’s going, with the warmth so they would be more active and make better bread rather than as a freezing prevention measure. As a result, the bread in San Francisco was predominately sourdough, with bakeries such as the Boudin Bakery still baking today after having been founded in the mid nineteenth century. San Francisco sourdough is the most famous sourdough bread with evidence of continuous production since 1849. History point to the California gold rush for it;s popularity when miners were nicknamed sour doughs after their bread. Here in the UK, greater and earlier urbanisation, and the later invention of the Chorleywood process enabling the mass production of bread using softer English wheats moved baking away from small scale and artisanal production towards larger industrial methods. However, with the current triumph of television baking, and a re-invigoration of interest in the quality of the food we eat after the nadir of the post war period, interest in sourdoughs from smaller bakeries and home production is once again on the rise. Share the post "The History of Sourdough Bread"
I love the idea of Dr Who, esp Malcolm Tucker-in his time machine- returning to find the origins of the use of leavening. But even more- a time when all bread was sourdough- aaahhhh. The link between brewing and baking bread is also very interesting & a while ago I read about this in Dan Lepards’ The Handmade Loaf. Thanks. I really loved this article. I made sourdough bread without using commercial yeast. It was quite interesting, and it took a long time to rise. I’ve been on a bread-making binge for months. I’ve also been researching how bread was made during historical times. They also mention yeast in the Bible. Yes, as you pointed out, been around for ever, seems like! Really interesting post with loads of research, enjoyed reading it. Those loaves of bread look so tasty, I can practically taste them with butter and home made cherry jam!! Wonderful article. 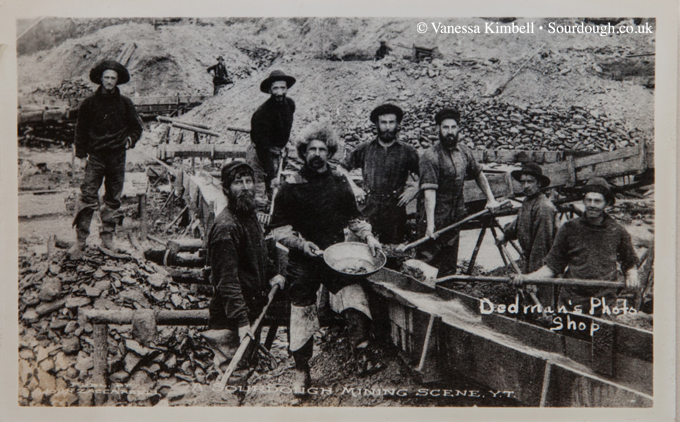 Just wanted to note that the miners known as “Sourdoughs” were from the Klondike Gold Rush of the 1890s. (The California miners had much less trouble getting commercial leavening agents.) I was wondering if you have seen early sources praising sourdough bread for its sour tang — I’ve been trying to track that down but haven’t been able to find positive references to a sour taste before 1904. Thanks again for a fascinating article. Thanks for that reference and the great quote! What an excellent dip into the long and interesting history of sourdough! I love the quotes and especially the old pictures you added in. It’s amazing humans have been using yeast/bacteria in this way for so long and it continues on today.